Lowerhouse mill was built in 1818/19 by Philip Antrobus. 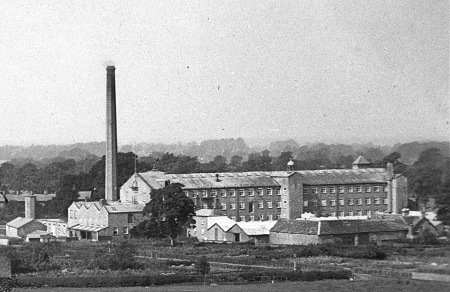 It is not clear whether the mill was used by Antrobus before his early death in October 1830. The mill was taken over in 1832 by Samuel Greg junior who certainly used it for cotton spinning. The mill was typical of its era, built of local stone, four stories high with long open floors. It was water powered, having a long narrow mill pool immediately above the wheel house. This was fed from the river Dean, the last wheel on its way from Rainow to Wilmslow. More on mill ponds. Steam power was added at a later date. Various additional buildings have been added over the years around the original building, but the mill remains largely untouched. The boiler house was provided with a beautiful octagonal chimney, but unfortunately this has been shortened several times in the late 20th and early 21st centuries, now being little more than half its original height (2015). Lowerhouse was some distance from Bollington and was connected only to Bollington Cross via Moss Brow – Albert Road wasn’t built until 1868. As a result Antrobus had had to build a complete community at Lowerhouse, with fifty terraced cottages and other houses for his workforce. This isolation and integrated community suited Greg very well because he wanted to develop an ‘improved’ workforce in a location not unlike a smaller version of what we call a garden city – something like Bourneville (built by the Cadbury family southwest of Birmingham). Greg provided gardens, allotments, a school, a library and evening classes for his workers to learn how to grow vegetables, how to feed themselves properly and care for their health. Greg called it ‘Goldenthal’ – Happy Valley. Today the term is applied to the whole of Bollington, but it originally applied only to Lowerhouse! In theory this was supposed to ensure that Greg had a happy, healthy and compliant workforce. However, it all went very wrong in 1847 when Greg desired to introduce new machinery into the mill and the workers objected. They went on strike and the shock was so great that Greg, being a sensitive and Godly man, retired to his home, Mount, in Bench Lane (Flash Lane today), and never went near the mill again. See the Samuel Greg page for more on this interesting man. Under Greg’s management the mill was not entirely successful, having run into both debt and labour problems – he was not really cut out for the job. Once he left, two of his brothers moved in and took over the management with rather more success. 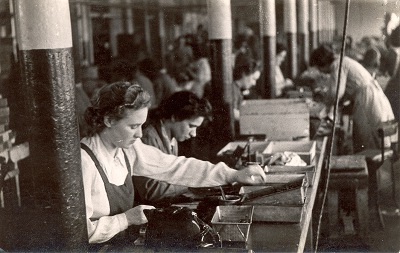 At a later time, bleaching and dyeing were also carried out at the mill. By the 1930s, cotton was suffering one of its economic doldrums and Lowerhouse ceased spinning. 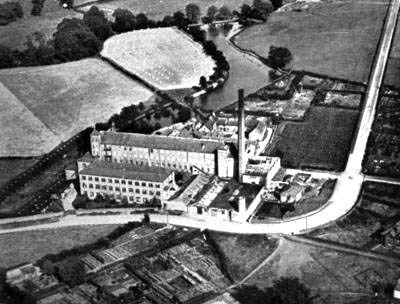 The mill was taken over by Slater Harrison who coat paper and card and remain there as one of Bollington’s most successful industrial businesses. Radions, (1923-25) who repaired radio valves, and developed and manufactured their own new valves. 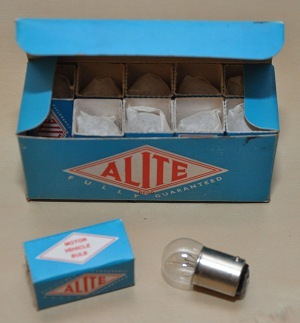 Associated Lighting, (1930s – 1970s) which supplied 80% of the UK automotive industry demand for vehicle light bulbs, although no longer from Lowerhouse. Their registered trade name was ‘Alite’ (left). V & E Friedland, (1939-) moved from London to reduce the risk of being bombed in WWII. Then, they made electrical components for military vehicles and aircraft. After the war they turned to making door bells and chimes. They later moved to Macclesfield, and later, to Stockport. One of the managers who moved from London and became a much valued member of the Bollington community was Harry Pleeth. His partner in the business was Sid Hartley whose wife Mary became a very active and long serving Bollington councillor.